X-Plane is a flight simulator for personal computers produced by Laminar Research. It runs on iOS, Linux, MacOS or Windows-based PCs. X-Plane is packaged with other software to build and customize aircraft and scenery, offering a complete flight simulation environment. X-Plane also has a plug-in architecture that allows users to create their own modules, extending the functionality of the software. X-Plane distinguishes itself by implementing a concept known as blade element theory. Traditionally, flight simulators try to emulate the real-world performance of an aircraft by using look-up tables to determine things such as lift or drag. 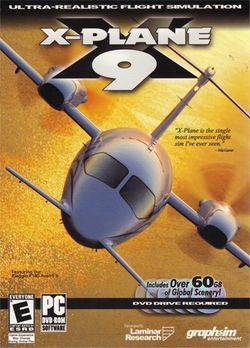 These simulators do a good job of simulating the flight characteristics of the aircraft they were designed to simulate, but are not useful in design work, and do not predict the performance of aircraft when the actual figures are not available. Blade-element theory attempts to improve on this by individually evaluating the parts that constitute an aircraft. A wing, for example, may be made up of many sections (one to four is typical), and each section is further divided into as many as ten separate sections, then the lift and drag of each section are calculated, and the resulting effect is applied to the whole aircraft. When this process is applied to each component, the simulated aircraft will fly virtually like its real counterpart does. This approach allows users to design aircraft on their computer quickly and easily, as the simulator engine will show immediately how an aircraft with a particular design might perform in the real world. X-Plane is capable of modeling fairly complex aircraft designs, including helicopters, rotorcraft, tilt-rotor craft and rockets. Famous real world aircraft modeled in X-Plane include the V-22 Osprey, the Harrier Jump Jet, the NASA Space Shuttle, and Scaled Composites' SpaceShipOne. Blade element theory does have its shortcomings, as it can sometimes be difficult to design an aircraft that performs precisely like the real-world aircraft. However, as the flight model is refined, the simulator can better resemble real-world performance, as well as the aircraft's quirks and design flaws. This page was last edited on 16 August 2016, at 15:28.